When I think about what goes into making a good shade garden, three things come to mind. #1 a Focal point(s) man-made or natural. #2 Plant Color to add light to the garden. #3 Shapes of Leaves for variety and visual interest. When working with a shade garden, the first thing you might want to think about is how to add light to the space. Trees can be selectively trimmed to remove branches, which would let light work its way down to the ground. A good tree service, with a professional arborist would know how to eliminate selective branches from the trees, to reduce the canopy. He or she would also know how to limb up a tree (remove bottom branches) to add more light to the gardening area. FOCAL POINT ..Do to the fact, that the shade garden will not have a riot of color, from constantly blooming flowers, throughout the growing season, adding one or more focal points, for visual interest is a must. My friends Ann and Jerry have a woodland / shade garden, that is under the canopy of many pine trees, that are behind their house. As a focal point, they sited a charming Amish made garden shed / play house for the grandchildren, in the center-back of their property. You can see it from every room in the back of their house. Ann designed paths from the main house, to the play house, and through the garden as a woodland walk. The paths are outlined with the centers of tree branches laid on the ground. There is a bench or two, and even a small bridge, that crosses a dry stream of river rocks, for extra visual interest. Many shade tolerant perennials, evergreens, and deciduous bushes add year round interest. If a person does not have space for an out building, siting a beautiful bench or a pair of chairs, flanked by a couple of urns, planted up in shade loving flowers would also be nice. Another option would be to use a large urn on pedestal, or modern or classical sculpture (figurative) as a focal point. A secondary focal point could be the installation of some beautiful stones / rocks in the garden. Make groupings of them, here and there in the front and middle of beds and borders. Bury them in the ground about 1/3 so they look like they were pushed out of the ground in a natural way. Don’t just set them on the ground. Also think stacked stone pyramids. Stack progressively flat stones, one on top of the other. Almost like making a naturalistic sculpture. Many garden centers, antique stores, and black smiths sell iron creations that look great in the garden. Look for cast iron birds, dogs, chickens, rabbits, etc in rust tone. Iron trellises, tuteurs, gazing ball holders, and other fanciful / whimsical creations are also interesting additions. Carved stone is another material that adds interest to the shade garden. Look for stone spheres, troughs, obelisks, millstone-grinding wheels, stone mushroom, etc. Stone pavers also add visual interest at ground level. Don’t forget natural toned poured cement animals, bird baths, and statuary. Left outside and only covered for winter, protected with plastic, they will weather nicely. If you are a Gnome Lover, I give you permission to have ONE. Just site him / her so it is kind of peeking out from behind foliage, as if it is hiding from you. When making paths in the shade garden, design them for two to walk abreast, if possible. Cover them with mulch, or even pine needles, if you can get that. Stepping stones, placed here and there in the mulch would be an extra bit of interest. Don’t forget the birds. Site fanciful bird houses on trees and poles. They can be quite sculptural looking, you know. When looking for objects to decorate your shade garden, try to find things that are natural / organic colored. Look for things that are rust toned, black, dark green, or a stone colored. Try not to have too many bright colored pieces all over the place. Here at Whimsey Hill, most of my garden ornaments are a rust, black and dark green toned. I do have some Bright Colored Objects, that I painted a Happy Lemon Yellow. The lemon yellow matches the one thousand plus daffodils that come up in the Spring, and the Gloriosa Daisies and yellow daylilies that grace the Summer Garden. That lemon yellow also looks fabulous against Fall leaves, and adds brightness and acts as a focal point in the Winter Garden, when the garden is all about clipped and natural formed evergreens, and the interesting silhouettes of deciduous bushes. If a house has a distinctive trim / accent color, like Red, Dutch Blue, Burgundy, etc., for a front door or shutters, take a color cue from your house and work it around your garden. Just make sure you do it in small amounts. Paint trellises, iron pieces, benches, etc that color. You are now tying your house to your garden. Many of my painted iron pieces were found in a color that was not attractive to me, but the shapes were interesting. Two coats of a latex gloss paint later, they are now just right. When it comes to garden ornaments Less Is More! Try to spread them out, so you discover / come upon them one at a time, unless many pieces are put together to make a grouping / display. Try to find all different sized ornaments, from ground hugging to really tall pieces. When grouping decorative garden elements think high (tall) medium, low, and flat, for heights of pieces. The number one think you don’t want to do is to fill your garden with too many pieces, as if you are a garden decoration craft person, and you are storing them in your garden until the next show. PLANT COLOR ..All gardens, no matter if they are sun filled or shade, are foliage tapestries, with flowers as a passing gift. You know, that the sun lit perennial garden is a foliage garden, before and after the perennials bloom. It is just that 2 week or so period, when most perennials bloom, that the attention is taken off of the sculptural shape of the plant, and put on the flower. When it comes to foliage, in either the full sun or shade garden, the colors of foliage are the same. Besides green, there is blue-green, chartreuse, burgundy and gray. In recent years, gold and rust have started to appear. In most gardens, sun lit or shade, green is the middle-tone / common color. In the shade garden, to that middle tone, you want to add as much light as possible. You will do this with flowers and leaves. WHITE flowering plants will give you the Most Light, followed by pale pink, hot pink, then red and red-orange. Red and red-orange will give you the least light. If you are a Romantic at Heart, and always thought a white garden was something you might like, the shade garden is the perfect place to have it. As I said before, white and silver-gray plants will add the most light to your garden. If you have them in your area, think white impatients, white astilbe, white wax and tuberous begonias, as well as white climbing hydrangea. Look for ferns, caladium and hosta, that have white markings. Lung wort looks like someone spattered its leaves with white paint. Be on the lookout for shade loving plants that are all white, edged in white, speckled, blotched, or striped. To your white flowers and foliage, add chartreuse, gold, and blue-green foliage plants. Even though you are gardening in shade, also add a few dark foliage plants, here and there for interest and extremes. Look for plants with blackish green and / or burgundy leaves. When working with busy looking foliage plants, spread them out. Sometimes plants, even though they possess the same colors will clash. Plant a Busy-Bright plant here, then separate it with some neutral green, chartreuse, or blue-green plant, as a calm spot for the eye to rest. Then plant another busy-bright plant. When it comes to planting, plant in groups of 2,3,5, etc. Repeat the same plants here and there in your garden for continuity. Check out better garden centers on your travels. If you are on a garden tour, ask the garden owner(s) where they buy their things. Shade plants are kept in sheltered places away from direct sun, under tents, or on the north or north-east side of the garden center. Look through mail order catalogs for shade plants. Search the words on your computer Shade Plants for Zone 5, (for example). I live in zone 5-4. Zone 5 means plants can survive if winter temperatures go down to -20 degrees. Zone 4 means -30 below zero. Take a chance planting plants that can take partial sun, in your shade garden. They might not grow to fast, or produce to many flowers, but you never know until you try. Oriental, Asiatic, and Daylilies can take some shade. If you get maybe 2 or 3 hours of light / sun a day, they will produce flowers. Look for plants with interesting foliage shapes first, so if there is not enough light for the plant to produce a flower, it might do fine just producing foliage. Look for plants called Spring Ephemerals. They all emerge in April, and are gone by May or June. Also plant Early Spring flowering bulbs like crocus, snow drops, and winter aconite. Helleborus and heuchera are also shade lovers. There are two kinds of shade that I know of Damp and Dry. Damp Shade is more bog like. With a garden like that, you will have to find plants that like having wet feet. Dry Shade is like the shade under Maple trees, where the tree’s roots are competing for moisture and nutrients along with what plants you sited under it. When planting under some trees, you will not be able to dig up large amounts of soil to plant in. You will have to open up pockets of earth to insert plants. When planting under evergreen trees, the soil will be more acid, so acid loving or tolerant plants will have to be found. SHAPES OF LEAVES ..When planting your shade garden, a wide variety of different leaf shapes is important. Look of plants with leaves that are heart-shaped, grassy, fern like, maple, oak, round, fan, and almond. Look for plants that have small, medium, and large-sized leaves. Pair large leaves next to small, grassy next to fern like, heart next to almond, etc. Plant things that are completely different next to each other. When planting the shade garden think mass planting with some specimens here and there. Finally, If all else fails FAKE IT ..My Mother’s next door neighbors always have the most beautiful red geraniums blooming in urns, hanging baskets, and flower boxes around their house. One day it dawned on me, the ones growing on the north side of their house were just as flower filled, and healthy as the ones with south or south-west exposures. I had to find out. I walked up close to their front door and to my surprise, they were FAKE. High quality silk geraniums, nicely fluffed up, planted with real vinca vines. The lady said to me Don’t tell my secret, but I buy new silk geraniums every two years, to replace the old ones that fade. So now you have it. I hope you got inspired by this post. Just do me one favor….If you go and buy silk flowers for your garden, try to buy ones that are representative of real, not fantasy plants. Try to buy ones that are natural colors. No day-glow, fluorescent, or off beat shades..Please! Companion Posts ..A lot of my past articles are important for you to read. They contain a lot of information that covers different aspects of design that you can apply to the Shade Garden. Foliage is a major issue in the shade garden. Read When Designing a Perennial Garden it’s all about the shapes of Leaves 1-15-2011. To have some ideas on laying out plants in the shade garden read How to Plant (Design) a Garden, Mass versus Specimen Planting 2-17-2011. For working colored foliage around your garden read Colored foliage adds the WOW factor to a Garden 2-22-2011. Stagger Plant Heights when Planting (Designing) a Garden 2-23-2011 will get you thinking about siting different sizes of plants. Designing / Planting the Hosta Garden 8-21-2011 will get you to look at leaves in a different way. AND, believe it or not, My post titled Arranging Your Decorative Accessories (Knickknacks and Collectibles) 6-7-2011 will get you thinking about making arrangements of man-made and natural elements in your shade garden. An arrangement inside is no different from one place outside. This entry was posted in Garden Design Principles, planting a SHADE GARDEN, San Francisco Chronicle / eHow references or resources, The Autumn(Fall) Garden, The Spring Garden, The Summer Garden. Bookmark the permalink. I like your suggestion of white against the darker greens and blues of my hostas…right now, I have a grouping of big blue hostas under a maple. Behind them is a rustic looking St Francis statue…and beneath the hostas are a circle of of pale impatiens…the best they’ve grown in quite awhile. Timberwyck’s garden is drawing to a close and I’m looking at which of my potted plants will be invited to winter-over in the sunroom. I’ll be taking your suggestions and looking to see where I can add white. 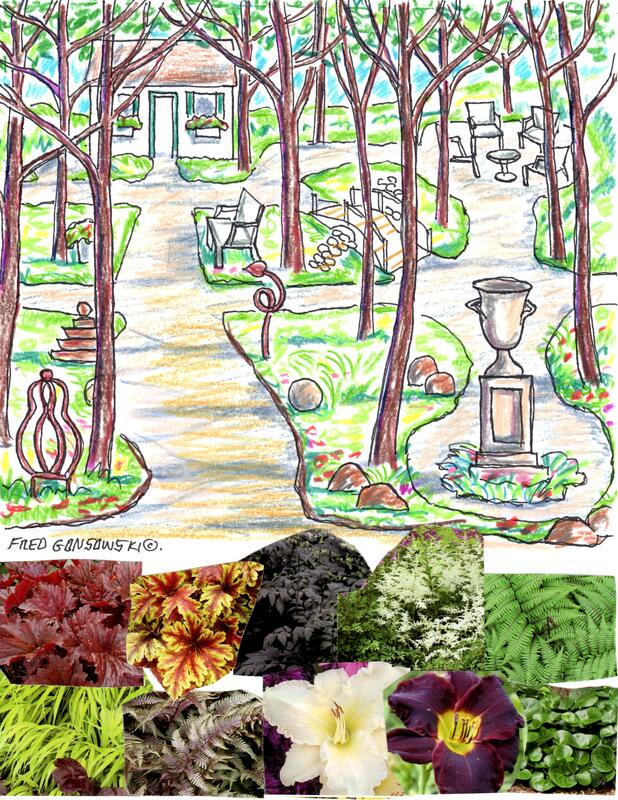 Thanks for your shade garden suggestions, Fred!